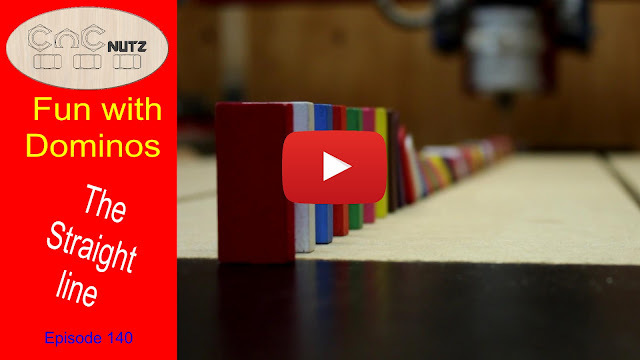 I was asked by my neighbour, Tim, to make some Domino related projects that help young children set up Dominos so they could be knocked down. I remember doing this myself as a youngster and it was always frustrating when they get away on you before you are ready. In those days we made our own Dominos and my brothers and I would set them up around the room, then knock them down. How times have changed. I'm sure there's an App you can put on your Ipad to do this for you in the virtual world. But for those of us who still live in this reality here is the next best thing. It was designed by Tim and we added the puzzle ends to it so they could lock together. This allows the sticks to be shorter but you are still able to set up long lines by joining multiple of them together. I'm afraid there is no file available to make these at this time but there will be for the next Domino project which will be a bit more curvey and even easier to use.